Earth is the only planet in the solar system with an atmosphere that can sustain life. The blanket of gases not only contains the air that we breathe but also protects us from the blasts of heat and radiation emanating from the sun. It warms the planet by day and cools it at night. ​This unit is a minimum of 2 hours. The atmosphere is a dynamic system that is essential to life on Earth. Can there ever be a stable climate? To what extent are human influences on climate greater? 6.1.U1 ​The atmosphere is a dynamic system (with inputs, outputs, flows and storages) that has undergone changes throughout geological time. The atmosphere is the result of energy from the sun producing the movements or currents in the atmosphere. This energy, the Earth's movement relative to the sun, and the components of the atmosphere and of the Earth's surface maintain the long-term climate, the short-term weather, and the temperature conditions. These provide conditions fit for the forms of life found on Earth. The condition of the physical world affects and is affected by the life present. The entire system is called the biogeochemical system. Living organisms (biotic components) have transformed the atmospheric composition of the Earth and vice versa throughout history. James Lovelock, author of Gaia, proposes that the atmosphere owes its current composition to feedback from living systems. He remarks that life on Earth requires a particular atmospheric composition, and this composition is in turn maintained by the interaction between biological systems and the atmospheric system. 6.1.U2 The atmosphere is a predominantly a mixture of nitrogen and oxygen, with smaller amounts of carbon dioxide, argon, water vapour and other trace gases. other trace gases, meaning they occur in very small amounts. produced in minute quantities in natural processes. However, industrial and other technological human activities (such as automobile traffic) have begun to increase the amounts of materials such as CO2 by amounts that are beginning to make a difference in the balance of circulation and radiation absorption in the troposphere. Effects of these changes range from local atmospheric problems, like smog, to problems of much greater scale, such as global climate change. Nitrogen - 78% - Dilutes oxygen and prevents rapid burning at the earth's surface. Living things need it to make proteins. Nitrogen cannot be used directly from the air. The Nitrogen Cycle is nature's way of supplying the needed nitrogen for living things. Oxygen - 21% - Used by all living things. Essential for respiration. It is necessary for combustion or burning. Argon - 0.9% - Used in light bulbs. Carbon Dioxide - 0.03% - Plants use it to make oxygen. Acts as a blanket and prevents the escape of heat into outer space. Scientists are afraid that the burning of fossil fuels such as coal and oil are adding more carbon dioxide to the atmosphere. Water Vapor - 0.0 to 4.0% - Essential for life processes. Also prevents heat loss from the earth. Trace gases - gases found only in very small amounts. They include neon, helium, krypton, and xenon. 6.1.U3 Human activities impact atmospheric composition through altering inputs and outputs of the system. Changes in the concentrations of atmospheric gases—such as ozone, carbon dioxide, and water vapour—have significant effects on ecosystems. Most scientists believe that human activity is altering the composition of the atmosphere by increasing the concentration of greenhouse gases (GHGs). ​The recent attention given to the greenhouse effect and global warming is based on the recorded increases in concentrations of some of the greenhouse gases due to human activity. Of particular interest are water vapor, carbon dioxide, methane, nitrous oxide, chlorofluorocarbons, and ozone. With the exception of chlorofluorocarbons, all of these gases occur naturally and are also produced by human activity. 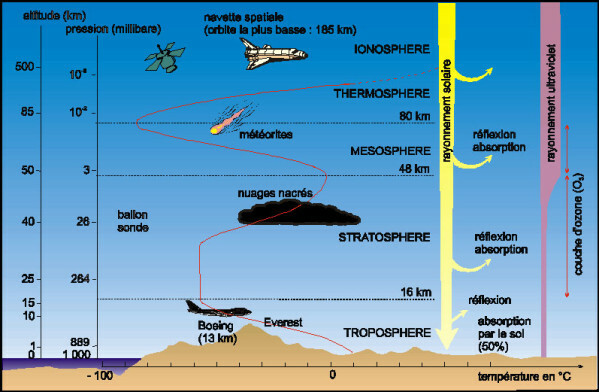 6.1.U4 Most reactions connected to living systems occur in the inner layers of the atmosphere, which are the troposphere (0–10 km above sea level) and the stratosphere (10–50 km above sea level). most affected by anthropogenic (or man-made) pollutants. beneficial because it has the effect of diluting pollutants, which can reduce harmful impacts on a local level. On the other hand, this dispersion also results in the movement of air pollutants (and therefore air pollution problems) from areas of high pollution production to areas of lower production. For example, pollutants produced in an industrialized and heavily populated city often adversely impact smaller communities and ecosystems in a large surrounding area. ​The stratosphere is the layer just above the troposphere. It is approximately 40 kilometers thick and is composed mostly of dry stable air. In contrast to the troposphere, pollutants in the stratosphere do not disperse, and tend to remain in the atmosphere for long periods of time. 6.1.U5 Most clouds form in the troposphere and play an important role in the albedo effect of the planet. Albedo is a measure of the reflectivity of a surface. The albedo effect when applied to the Earth is a measure of how much of the Sun's energy is reflected back into space. More water vapour in the atmosphere means more cloud formation. More clouds lead to increased albedo of the earth. ​Different parts of the Earth have different albedos. For example, ocean surfaces and rain forests have low albedos, which means that they reflect only a small portion of the sun's energy. Desert's, ice, and clouds, however, have high albedos; they reflect a large portion of the sun's energy. Over the whole surface of the Earth, about 30 percent of incoming solar energy is reflected back to space. 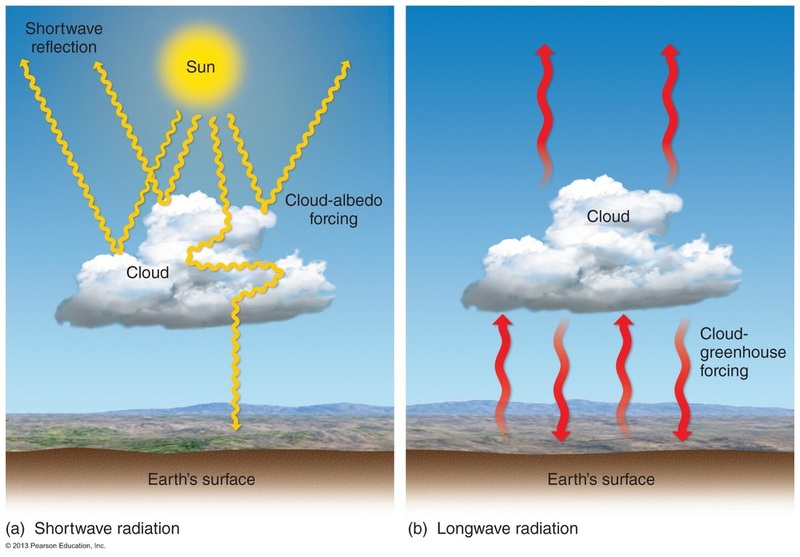 Because a cloud usually has a higher albedo than the surface beneath it, the cloud reflects more shortwave radiation back to space than the surface would in the absence of the cloud, thus leaving less solar energy available to heat the surface and atmosphere. 6.1.U6 The greenhouse effect of the atmosphere is a natural and necessary phenomenon maintaining suitable temperatures for living systems. The term 'Greenhouse Effect' is commonly used to describe the increase in the Earth's average temperature that has been recorded over the past 100 years. However, without the 'natural greenhouse effect', life on Earth would be very different to that seen today. The Earth receives its life sustaining warmth from the Sun. On its way to the Earth's surface most of the heat energy passes through the Earth's atmosphere, while a smaller proportion is reflected back into space. Without a greenhouse effect, radiation from the Sun (mostly in the form of visible light) would travel to Earth and be changed into heat, only to be lost to space. The energy warms the Earth's surface, and as the temperature increases, the Earth radiates heat energy (infrared energy) back into the atmosphere. As this energy has a different wavelength to that coming from the sun, some is absorbed by gases in the atmosphere. 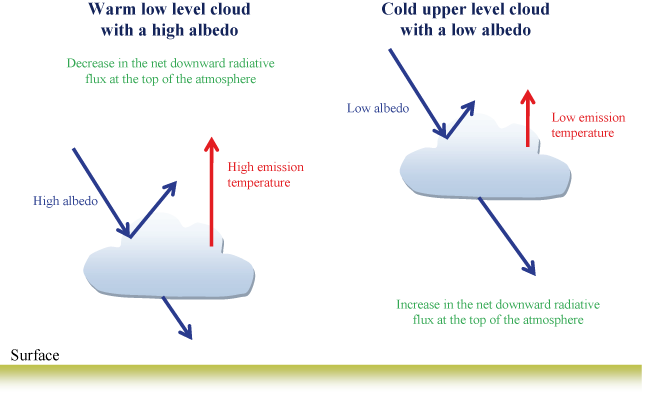 6.1.A1 ​Discuss the role of the albedo effect from clouds in regulating global average temperature. Clouds have a major role in reflecting some of the Sun's radiation back into space. The proportion of incident radiation reflected by a substance is called its albedo. The albedo of low thick clouds such as stratocumulus is about 90 percent. The albedo of high thin clouds such as cirrus may be as low as 10 percent. The albedo could vary with the wavelength of the radiation, but for clouds it does not as evidenced by the fact that they are white under white light. At sunrise and sunset the incident light is red, orange or yellow and the clouds reflect this light without modification. The albedo of clouds for infrared radiation is likely the same for visible light. There are two sides, top and bottom, to clouds that may be involved in the reflection of radiation. The albedo effect has a significant impact on our climate. The lower the albedo, the more radiation from the Sun that gets absorbed by the planet, and temperatures will rise. If the albedo is higher, and the Earth is more reflective, more of the radiation is returned to space, and the planet cools. ​The ‘greenhouse effect’ is an atmospheric heating phenomenon in which the Earth experiences rise in temperature because certain gases (water vapor, carbon dioxide, nitrous oxide, and methane) in the atmosphere allow incoming sunlight to pass through but trap heat radiated from the earth’s surface. If these gases wouldn’t trap heat in the atmosphere, the temperature of the earth would be about 33 degrees centigrade colder on average. Because how these gases warm our planet, they are called as greenhouse gases and the effect they create in the atmosphere is called as greenhouse effect. ​When the thermal radiation (or heat) arrives from the sun, some of it is bounced from the surface of the Earth by the ozone layer (which is the reason we can safely walk out in the sun, is this prevents the most dangerous radiation from the sun getting through the atmosphere), leaving only some heat to make it through to heat the Earth. This heat then rises back through the atmosphere, but most of it gets trapped by the greenhouse gases, which causes it to remain in the Earth’s atmosphere. ​​​​​Correct use of terminology is a key skill in ESS. It is essential to use key terms correctly when communicating your understanding, particularly in assessments. Use the quizlet flashcards or other tools such as learn, scatter, space race, speller and test to help you master the vocabulary. Impact to the atmosphere from pollutants can be localized, as evidenced by the destruction of the ozone layer over the poles of the Earth. The atmosphere is a dynamic system—how should we react when we have evidence that does not fit with an existing theory? Gases essential to life are explored through the history of the atmosphere. In this video Paul Andersen explains how the atmosphere surrounds the planet. The state of the atmosphere is climate and is affected by unequal heating, the Coriolis Effect, and the ocean. Convection cells and ENSO are discussed in detail. As the Earth’s surface temperature gradually rises, it has become vital for us to predict the rate of this increase with as much precision as possible. In order to do that, scientists need to understand more about aerosols and clouds. Jasper Kirkby details an experiment at CERN that aims to do just that. The temperature of earth has been relatively constant over time. This is possible because as the planet absorbs solar radiation, it also emits longwave radiation into space. Despite this radiative equilibrium, some longwave radiation remains trapped beneath the atmosphere of the earth and warms the surface of the earth. This phenomenon is called the "greenhouse effect."